When you play games at Moonlight Legend, you'll earn cards, coupons, and Starseed Points. The cards and coupons are pretty easy to understand, but the Starseed Points aren't regular currency. You'll use them to purchase Senshi powers that will let you do special things around the site. Now that we've gotten the details out of the way, why not review the list of powers and their costs? Take all update freebies back to the oldest available news post when you rejoin. You'll also be granted prejoin status! You be marked with a special star on the member list. Member cards are worth one. When you learn this power, you may go back and add one point of card worth AND one stamp on your stamp card for EACH member card you already have. And, of course, all member cards you get in the future will be worth one card and one stamp. View the puzzle images currently in use for the games - use them as a reference when assembling! Once you purchase this power, you'll get the password for the games page. Receive one choice regular card per week! No need to comment anywhere, just log it as weekly Collection on your trade post. Receive one choice regular coupon on top of the standard donation rewards when submitting level badges or deck images. Your forum account will be edited to display a custom title and sprite under your avatar. When you purchase this power, send me a PM on the forum with the information. Sailor Moon sprites only, please. Take the supersized "freebie frenzy" package of goodies (instead of the smaller regular package) from updates. Receive double rewards from the Freebies game as well - just reload for your second helping! Receive one choice special card every two weeks! No need to comment anywhere, just log it as biweekly Stargathering on your trade post. Create a mini mastery deck of your five favorite cards. Other members will be able to master it for rewards - and every time they do, YOU get one choice special and one choice regular! Once every six weeks, you can be lazy and get all the rewards for a set of biweekly games without playing them. :p Send Rahenna a forum PM to redeem this prize. 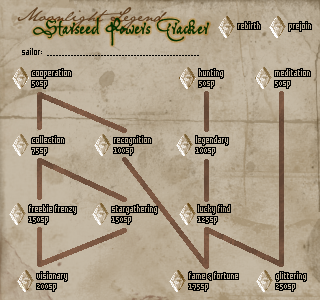 In the past, Starseed Powers were purchased according to level rules. There are no more level requirements. BUT that doesn't mean you can just go and buy the most powerful skill right away! If you're a gamer, you may have encountered a skill tree before, and you probably know how it works. If you don't have experience with skill trees, here's the basics!